If I were given a chance to pack my bags and relocate to another place within the Philippines, there’s a big chance that I choose Cebu. It’s a place that has everything. It has the conveniences that any modern city has, yet, it successfully blends in the charms from its rich past. It’s a bustling place, yet within its vicinity is the serenity that nature brings (thank goodness, Cebuanos took care of their place very well!). And let’s not forget– Cebu has great food. My last time there was 2010. 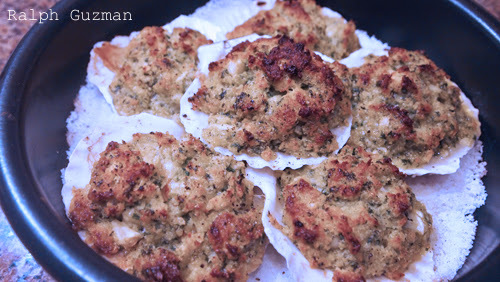 And though it has been quite some time since then, I vividly remember a favorite dish — their baked scallops. For me, it was simply one of the most delicious dishes I have ever tasted. Now, normally, I wouldn’t dare attempt to ask a cook for a recipe that is served in a commercial establishment. Let’s just say that I respect intellectual property and normally, they also keep secret recipes, secret. But I told myself, what do I have to lose by asking? So I asked. To my very pleasant surprise, a middle-aged man, who had been cooking at Sutokil for years, gave me all the details! Thank you, Manong! Anyway, just recently, I craved for the Sutokil-style scallops once again when I saw some wonderful — but frozen — scallops at the supermarket. Good thing I remembered the recipe, which I am happy to share with all of you now. I bought frozen scallops. Of course, fresh ones are always better. Unfortunately, here in the Manila, you’d really have to get out of your way to get fresh ones. I got mine from the supermarket. 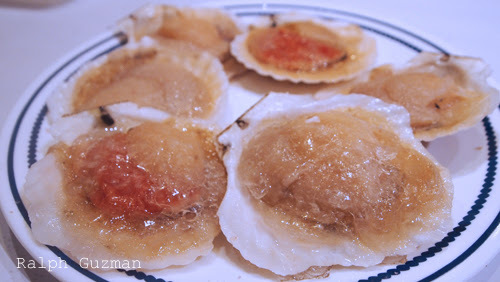 I brushed the shells to remove any excess dirt, and drizzled lemon juice on them to remove any fishy taste. I add garlic, parsley, more lemon juice, salt and pepper. And the secret ingredient: margarine. The guy was very clear about using Star Margarine because of its flavor. Well, I always prefer butter over margarine, but for this one, I did choose margarine. For extra flavor, I got the garlic-flavored variant of Star. It was perfect. Finally, I added cheese. The guy uses ordinary cheddar cheese. What I did was to use a combination of cheddar, vintage cheddar, and parmesan. 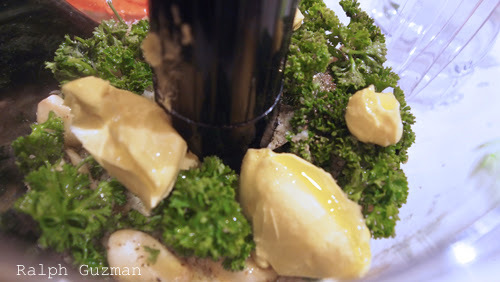 Pulse them in the food processor until all the ingredients have well combined. I used a food processor for its convenience. All you have to do is put everything in, and it does all the work for you. Of course, one can do this manually. 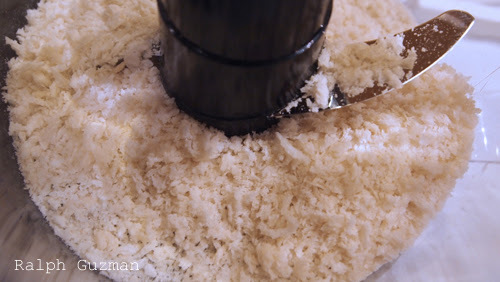 So don’t worry if a food processor isn’t around. 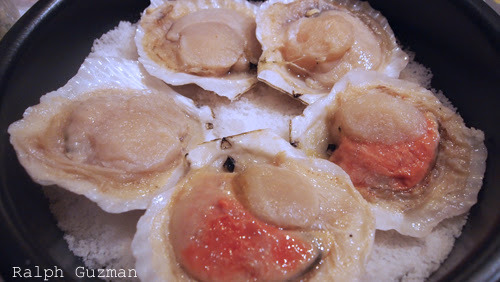 Spread the topping onto each scallop. By then, I’ve put the scallops on a bed of rock salt. Just an aside — I’ve always wondered why restaurants served scallops and oysters on rock salt. Apparently, they’re there to keep the shells leveled. The salt also makes sure that the heat is properly distributed from above and under when baking (or steaming). For me, it’s both functional and aesthetic. For the thickness of the topping, best to follow your preference. I actually wanted a thick topping. My wife, on the other hand, preferred a thin topping. Bake for about 15 minutes at 175 C (350 F) or until when the topping is golden brown. Do not over cook! I love how the topping makes protects the scallops from getting baked too fast, and how it prevents them from drying up during the baking. That’s it. And it’s that easy. This is a dish that is wonderful for any special occasion, and must be shared with the ones you love. Spread the love, people! By the way, the funny thing is, I’ve tried these same toppings two or three years ago with cream dory as a dish for Christmas dinner and it also tasted good. 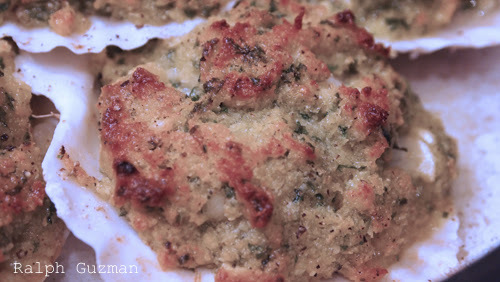 But between dory and scallops, go for the scallops if they’re available. Enjoy! This entry was posted in Food + Recipes, Seafood and tagged Bake Scallops Recipe, Bake Scallops Sutokil, Baked Scallops, Baked Scallops Recipe, Filipino Dishes, Filipino Seafood Recipes, Scallop Recipes, Scallops Recipes, Sutokil Cebu Scallops, Sutokil Style Baked Scallops by Ralph. Bookmark the permalink.